Content marketing is a smart SEO play. It’s how you build an archive of searchable answers. It’s a natural way to use top keywords. It’s an opportunity to get in front of your ad-adverse audience without paying for airtime. In an Ascend2 survey, 72 percent of marketers identified content as the most effective way to optimize for search success. So why are some companies still uncertain about the benefits of content marketing? Because there’s a lot of hype. And where there are buzzwords, there is skepticism. “Non-believers” may not know what results companies actually see from content marketing strategies in practice. The first sign of content marketing success is traffic. Back in the early days of SEO, this was the end-all be-all of online strategies. Companies just wanted to get more people to their websites. These days, it’s still important. But we understand that traffic is just the start of a winning web marketing strategy. Once you get people to your site, you need to make sure they’re engaged and go on to buy from you. Traffic is just the start of a winning web marketing strategy. Once you get people to your site, you need to make sure they’re engaged and go on to buy from you. 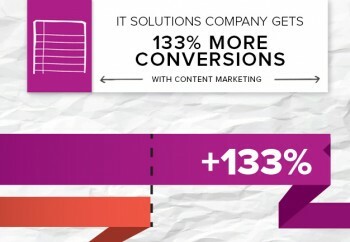 The content strategy we created for the IT company does both. It features SEO-focused news articles that encourage a deeper reading experience. Longer stories that provide supporting research and historical context educates readers. Embedded images and engaging subheads keep them engaged in the narrative. We knew the new approach was resonating with readers when we saw that the number of blog entrances increased 39 percent during a business quarter. This suggests the company’s content is showing up more often in search results, or it’s being referenced in third-party sites. Ideally, this is how content marketing works. You create an asset that’s valuable to a specific audience. You publish it. People read it and take notice. They share it. Perhaps they share it with someone who has a vested interest in this information, and that individual publishes a link to the piece on another site that targets the same audience. That single blog is now reaching a much wider group and getting traffic from multiple sources. And it’s all pointing readers back to your company’s website. Content marketing doesn’t live and die by traffic numbers. A site that gets hundreds of thousands of daily visits won’t be successful if visitors just get there and immediately leave. They need to take some kind of action to be worthwhile visits. The way to keep visitors on your site is through engaging content. Pictures, videos and written information all contribute to a page’s stickiness. These are important metrics because it implies the content is delivering what the headline promised. It means people have a positive first impression of the site because they stick around. It indicates the content resonates with the target audience and people are taking the time to read entire articles. Traffic and engagement will set up the shot, but conversions matter most in marketing. Every strategy must ultimately contribute to the bottom line to be considered a success. These are the numbers you can bring to your supervisors to show your hard work is paying off, and not just eating into your budget. The content was bringing in website visitors and keeping them engaged. But more importantly, it was sparking enough interest in the brand and its products that readers were opting into conversations with the sales team. This is how deals are won. The prospects have already indicated they’re interested. They’ve already started the research process. Now, they’re committed to diving into the details and determining whether the services are a fit for their needs.